A permanent magnet is one which is made from a magnetised material and creates its own consistent magnetic field. An example is a refrigerator magnet used to hold notes on the refrigerator door. Materials that can be magnetised are said to be ferromagnetic or ferro. Such materials include; iron, cobalt, nickel, naturally occurring minerals like lodestone, and rare-earth metals. Despite the fact that ferromagnetic materials are the only ones strongly attracted to magnets to be considered magnetic, all other materials respond quite fast to a magnetic field. Temporary magnets do vary in composition since they are made of a material that behave like a permanent magnet when around a magnetic field. Example of temporary magnets include: soft iron devices like paper clips. These magnets are made by winding a wire around a core material. To magnetise the material, an electric current is passed through the winding wire. This creates a magnetic field which leads to magnetisation of the material. The magnetic field is usually strongest on the inside, and its strength is proportionate the strength of the current and the number of loops. The material used to create the electromagnet also affects the strength of the magnetic field. For example, if a wire is wound around a nonmagnetic material like a piece of wood, the magnetic field created will be very weak. However, if the material is a ferromagnetic material like iron, the result will be powerful magnets. These are commonly referred to as neodymium magnets. They are made through an extensive process involving rare earth metals. They are the most common types of magnets due to their strong power and efficiency. If you are in search of a magnet with a secure and powerful hold, then neodymium is usually the perfect choice. Nevertheless, since they are made of iron, they rust quite fast especially when exposed to wet conditions for a long time. This factor also makes them brittle than other types of magnets. Samarium cobalt magnets are also very powerful. They were developed in the 1970s, even before the neodymium magnets. One advantage of using this type of magnets is that they hardly corrode and have a better temperature resistance as compared to other magnets. This factor means that they can easily retain their magnetism even at extremely high or low temperature conditions. This makes them an ideal choice especially in applications that involve high or low temperatures. Despite this, they are slightly powerful than the neodymium magnets. 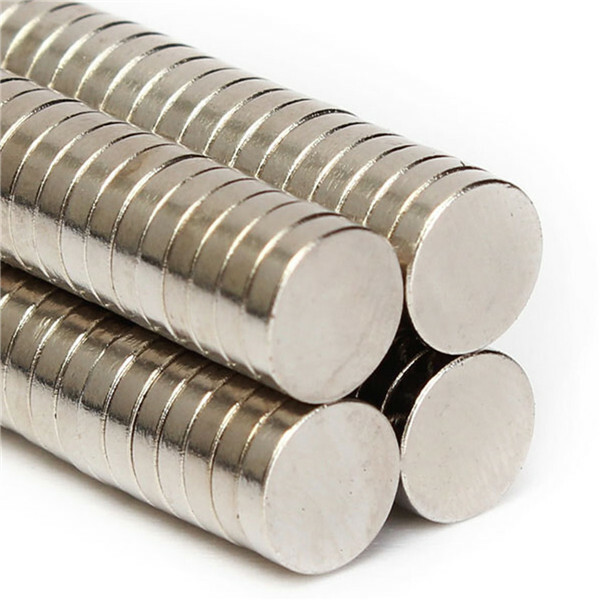 Alnico magnets are made from aluminium, nickel, and cobalt. They are not very common types of magnets and as they have been replaced by neodymium, ceramic, and samarium magnets. Although they are not very strong magnets, they can be used in basic applications such as fridge magnets. Ceramic magnets are quite common the market today. This is mostly due to the fact that they offer a very cheap magnet purchase option. Although they are not as powerful as the aforementioned magnets, they are mostly used as fridge magnets and for basic crafts due to their cost-effectiveness. Knowing the various types of magnets and their strengths and weaknesses can assist you when you go to buy magnets in the market for your different projects. However, if you are faced with any issue, we are here to help you out. Be free to contact us for any assistance. A very important factor to consider when buying a magnet is the temperature of application. As you might know, the magnetic field is not usually constant as it changes with the temperature of the surrounding. Due to their fairly cheap price, ferrite magnets are widely used. However, these type of magnets lose 25% of their flux output when exposed to temperatures ranging from 20°C - 150°C. Ferrite magnets also have low energy products- 10% of rare earth magnets. Therefore, when size and weight matter, like portable electronics and hard disk drives, rare earth magnets should be used. The issue of raw material availability is at the core of current discussions involving permanent magnets. The type of magnet that you decide to go for should be influenced by its general availability, ease of recovery from mined ore, geographic distribution, and open market trading. Of all the elements used to create magnetic materials, rare earth elements are quite ‘rare’ due to their geographic limitations on sourcing. China is the largest producer of rare earth oxides, metals, and alloys used in the world. There is an inconsequential production of neodymium magnets in the United States. An alternative to neodymium magnets is samarium, which has fewer sourcing limitations and performs way better when exposed to high temperatures. The strength of different magnets varies. For example, neodymium magnet is a very strong magnet compared to the others. Strong magnets are used in big industries such as cement industries, food processing industries, and chemical industries. On the other hand, small magnets are used in several small scale and electronic industries. The purpose of the magnet you want to purchase is critical when choosing a permanent magnet. In fact, this should be the main consideration. If your objective is to use the purchased magnets in big or small projects, you should choose it keenly. Each magnet serves its own purpose, so choose the one that is suitable for you. This factor is closely linked to the purpose of the magnet. This is because the objective will determine the kind of magnet you want and the attributes it should possess. Magnets can be customized in different shapes and sizes to fulfill your desires. You can easily identify the magnet that will suit your needs in the best way possible. You can also select a magnet that fulfills other parameters pertaining to surface field, magnetic flux, and diametric flux density. Another factor that you might care to consider is the rust resistance of that magnet you want to buy. Neodymium magnets rust quite fast and so they usually have a nickel coating to prevent rust. Nevertheless, using them in wet conditions will also lead to their corrosion. Samarium cobalt magnets hardly corrode and they are your best bet here. Permanent magnets have a lot of uses. Most individuals would be surprised by the implementation of magnets in everyday life. Each time you drive your car, magnets are used to assist you to conduct specific operations. Magnets are implemented in permanent magnet motors which control the windshield wipers and power windows of your vehicle. Many sensors cannot work without the intervention of magnets. For example, displacement and position sensors require magnets as position giver. Such sensors are applied to automation machines, machine tools, and robotics. In short, many electric motors and generators cannot manage to operate without permanent magnets. Alnico magnets are used in telephones and radars. They even play a critical role in loudspeakers and amplifiers. On the other hand, ceramic magnets are perfect for performing repulsion and attraction experiments. Ceramic magnets can also be used on lawnmowers. On their part, rare earth magnets like neodymium are usually used for research and physics education in the field of electrical engineering. •	Magnetic recording media contain a roll of magnetic tape. Information that makes up the sound and the video is encoded on the mag tape. Common audio cassettes also rely heavily on these kinds of tapes. Additionally, hard disks and floppy disks, in computers, use a thin magnetic coating to record data. •	Debit, credit, and automatic teller machine cards have a magnetic strip on one side. The strip encodes your information to contact your financial institution and connect with your account. •	Microphones and speakers utilise a current-carrying coil and a permanent magnet to convert electric energy into mechanical energy. This coil is wound over a bobbin attached to the speaker and it is responsible for carrying the signal as changing current that interacts with the magnetic field of the permanent magnet. After feeling the magnetic force, the voice call responds by moving the cone and pressurising neighbouring air to generate a sound. Microphones also use the same concept. The only difference is that a microphone has a membrane or diaphragm attached to the coil of a wire. This coil is located inside a specially shaped magnet. When the membrane is vibrated by the sound, the coil is also vibrated and as the coil moves around the magnetic field, a voltage is induced across the coil. This induced voltage drives current in the wire, emitting an original sound. •	Electric guitars also use magnetism to transduce the guitar strings’ vibration into electric current that can later be amplified. •	Electric generators and motors use a combination of a permanent magnet and electromagnet to convert electric energy into mechanical energy. •	Medical experts use magnetic resonance imaging to identify issues in a patient’s internal organs without invasive surgery. •	Chemists use nuclear magnetism to characterise synthesised components. •	Compasses have a magnetised pointer which aligns itself to the earth’s magnetic field. At Polarity Magnets®, we are a leading importer, manufacturer, and supplier of high quality magnets, magnetic labels, magnetic sheets and sheeting, magnetic papers, mag tapes, magnet tapes and magnet tapes. Our magnets come in different shapes, sizes, and possess distinct properties. Therefore, we can proudly say that we have something for everyone. If you are looking for the best magnets in the market right now, you are in the right place. Quality is our major priority and our products have been proven to outperform those of our competition time and again. Adding this to our over 20 years’ experience in the industry, you can be sure that you are in safe hands. We are ready to work with you to ensure that you get the right magnet for the task you want to accomplish. At the moment, we serve over 100,000 businesses in the UK alone and we would like you to be a part of our large customer base. Once you contact us, you will have your own dedicated account manager who will work with you to meet your lead time and budgets. Dealing with the same individual ensures that you save time and the hassle. Be very careful of other cheap alternatives. Most of them might end up costing you a lot more in the long run. Quality varies a lot in this industry and we would advise you to ensure that the quality you are ordering is top-notch. With us, you don’t have to worry as our products are guaranteed and branded. Are you ready to Take Action? If you are satisfied with what we have to offer, you can go ahead and place your order. You will find ordering through our platform to be quite quick and simple. Nevertheless, if you are finding trouble locating a product or have anything you want clarified, please contact one of our friendly sales team on 01268 768 768.